I've been having the same connection problems with League of Legends as well. Seems to happen around 5pm-12am then fixes itself. No issues here. Orcon VDSL. here are my results for OCE. Something spooky is going on with you guys. No issues here. For me the problem isn't increased lag, it's just huge amounts of packet loss about once every minute. Sometimes I get completely disconnected, though not often. My issue is very similar to what you describe. Packet loss intermittently (causing rubber banding). Just to be clear I am on Orcon Fibre, not VDSL. Clearly a problem going around, I get this issue with Arma3 Ozzy servers, Heroes of Newerth Ozzy servers, Dota servers, Ozzy TS servers, ONLY after 5-7pm and better after 11pm...... I get 100mb down 50mb up on fibire so. Tonight seems especially bad, anyone else having issues? can you switch global mode off and see if that helps? I imagine these sorts of services have the potential to play havoc with anything that is attempting to route traffic in efficient ways. My daughter plays League of Legends all the time. I just asked her for feedback regarding connection problems etc (particularly between 5PM and about midnight), and she reports no issues of note - all good. 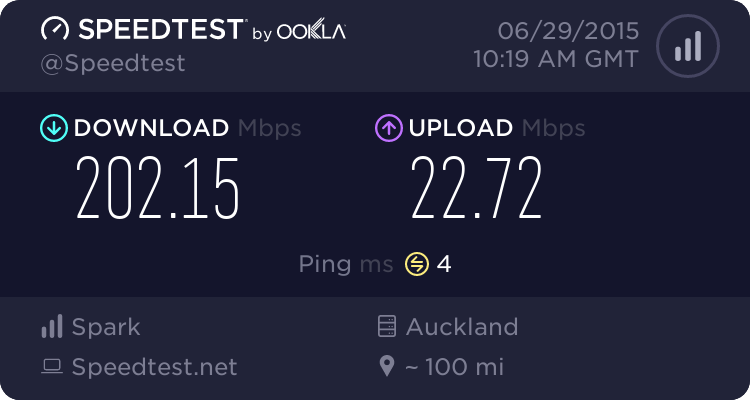 I am in Auckland, on Telecom VDSL. try doing trace routes to TS servers in AU or AU websites/IPs. Maybe i need to consider a new ISP, have been having these issues for about 3 months now and no resolution (Orcon Fibre 30MBPS).